We were in the tasting room at Willamette Valley Vineyards this evening, and convinced Jon (the tasting room manager) to open up a bottle of the 2001 Hoodview Vineyard Pinot Noir--the only single-vineyard pinot they currently have in stock that I hadn't tried. It was good. Real good. A nice nose of leather with a smooth silky taste and a quicker finish. This vineyard was planted 1990 off Hoodview Road in the Eola Hills. The microclimate at this location favors Pinot noir as it is a warm, southeast facing slope of well drained Jory soil. This soil is 4 to 7 feet deep and dark red from its iron content. Hoodview is the first Pinot that Jon fell in love with, and while I won't go that far, it's a good bottle of wine. Well hopefully some folks will find this note of worth... Tonight I sat down to dinner with a lovely woman, a stack of ribs, and a bottle of red that I had forgotten about. The woman was my lovely bride, the ribs were her specialty, and the wine was a 2004 Dolcetto from Erath Vineyards. Upon opening this bottle, a smokey aroma is what first tickles the nose. When trying to place it, Megan suggested that it reminded her of a campfire. This description is spot on. With time, the aroma of an oak barrel came through. Lastly, a hint of bitter chocolate is present, albeit subtle. Make no mistake, this is definitely a 'big red' that warrents a meal of equal strength. In this case, ribs seasoned with brown sugar, cayenne pepper, and paprika coupled with summer squash and green beans made an excellent trio. My palette and nose rate this red as a worthwhile purchase for a dinner with someone special. Cheers! So I'll keep it brief tonight and just say that I tried the Dogfish Head Red and White beer that Bob Woodshed recommended on his Beer Blog. I was not disappointed. It's made partly from Pinot Noir grapes, hence the post! Unlike my other contributors, I am not much of a blogger, so I will probably be more of a silent contributor contributing on a more sporadic basis. 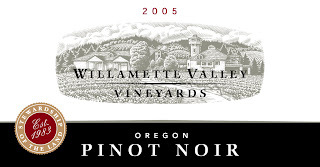 For the last couple of evenings I have been enjoying a bottle of 2005 Pinot Noir from Willamette Valley. I remember obtaining this bottle on my first trip to the vineyard when I became a member of the wine guild. It must be noted that I am preferential to white wines, and generally only drink reds when I "have" to. I want to talk a bit about this award winning wine. The color of it is one of the first things that I notice. Holding it up to light, it has the appearance of a deep grape red color. When swirled it lightly coats the glass. The nose on this Pinot is not too strong - it enters the nostrils warmly, and has a very light tart aroma. If you don't let it breathe a bit, both in the bottle and in your glass, the first sip can be a bit strong. After a few moments, however, one gets to taste a real full flavor that lasts just for a moment as the wine goes down the throat - there is no real aftertaste, and it is surprising that for such full flavor, it doesn't linger. This could be a good thing for those of us who are not overly huge fans of red wines. In one of his recent posts, Desilet talked about what he imagined his wine to go well with. This afternoon and now, while enjoying glasses of this Pinot, I imagine it going well with a nice medium rare Fillet Mignon (and I like my meat well done), lightly grilled potatoes seasoned in garlic and rosemary, with asparagus and carrots as the vegetables. This could also go well with a nice lamb. A Memorial Day weekend wine tour with Josh, Drew, Steve, and some other good friends (one from Wisconsin who had only loved macrobrew beer before coming to Oregon) brought us to Sokol Blosser winery. Sokol Blosser, located in Dundee Hills, Oregon is a family owned winery and was one of the first to be established in the Willamette Valley. Located on top of a beautiful vine covered hill, the tasting room feels like an elegant tree house with wood ceilings and large windows overlooking the winery. Sokol Blosser has a library of nine different varietals, ranging from pinot noir to Muller-Thurgau, with two blends, Meditrina and Evolution. Sokol Blosser is known not only for the wine and beautiful location, but for the dedication to running an environmentally friendly winery. Solar panels help provide electricity, and the winery boasts a Silver LEED certified cellar, built underground. What draws me first to Sokol Blosser's Evolution is the label. 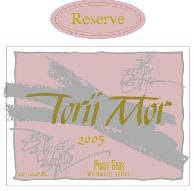 Most wine bottles have artist rentions of grape vines and swirly text naming the wine, convincing the drinker this wine will be fine and elegant. Not so with Evolution. The butter yellow label has a crafted feel, as if each one was handmade. The questions "Luck? Intention?" are lettered on the front, evoking a playful curiosity in how the simple elegance of Evolution is created. Evolution is a blend of nine white varietals. Sokol Blosser does not disclose which nine these are - it's up to the taster to figure it out. The nose of Evolution is reminiscient of a drier Reisling, with honey and tropical fruit notes. The front continues the flavor of a good Reisling, evolving into tropical citrus tones of pineapple and mango, and finishing like a clean, crisp Pinot Gris. Paired tonight with asparagus and cheddar stuffed chicken breasts, Evolution held up well to the sharp cheese but did not overpower the light flavor of chicken. Evolution would be wonderful served chilled on a breezy summer evening with a meal of white fish and grilled vegetables. After allowing Evolution to warm a bit during dinner, it becomes smoother and tastes of fresh ripe strawberries. Evolution is an easy to drink white blend, and will appeal to both crisp white lovers and those who gravitate toward sweeter dessert wines. Today brought a trip to Willamette Valley Vineyards, perhaps one of my favorite wine producers due to their great service, famous Pinot, and diverse portfolio of varietals--all done well. In fact, I'm such a fan, I'm a stockholder (see the bias coming out?) WVV is the largest producing winery in the state of Oregon and was one of the founders of this appellation. They are known for their Pinot Noir's, they have a darn good Pinot Gris (Wine Spectator best buy), a good Riesling, and an up-and-coming Chardonney. For the dessert wine conniosuers, can't beat their semi-sparkling muscat frizzante...marketed under the Tualatin Estate label. The trip today was to pick up the most recent shipment from the Oregon Wine Guild premier cru, a wonderful wine club that bring a red and a white every other month, with no membership fees, free reserve tastings, and a 20% discount on the shipments plus all wine purchased through the winery. Today's shipment included the 2006 Riesling as well as a 2004 Griffin Creek Cabernet Franc. Of course, stopping by the winery, a tasting was required. For some reason they were opening the really good stuff for us--we got into the 1998 Freedom Hill Pinot and the 1999 Karina Vineyard Pinot, in addition to the standard fare. 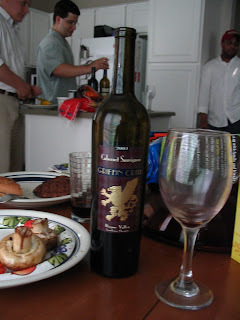 After the winery, a group of us proceeded to the Vina's for a BBQ, and that is where we cracked open the wine that I'll be reviewing today -- 2002 Griffin Creek Cabernet Sauvignon. Griffin Creek is the label WVV uses mostly on the bigger reds, as the grapes come from the Rogue Valley in Southern Oregon so the Willamette Valley label can't be used. This cab is a gorgeous dark red, almost burgundy, and as could be expected from a big red like this had good legs on it. The nose had strong peppery notes, and on the second glass after it had opened up a bit I started picking up some toffee and leather aroma. Upon tasting, it has a warm spicy feel with a lingering finish. After opening up, I detected a jammy fruitiness that could be overpowered by the bold spice if you aren't careful. For the technical details...the wine retails for $35, fermented in 100% stainless and barrelled in 50% new oak. It's 14.6% in alcohol and 886 cases bottled. This is a great wine meant to be consumed with heavy food. That's it for now--you'll be reading more about WVV in the future though (we have a lot of their wine to drink). OK, so first off, let me say that I'm certainly far from a wine expert. I drink what I like, and that is that. I'll also say that I'm loyal to a few particular wineries, for good reason, and I'm sure you'll be able to tell as we progress through blogdomness. I'm also a strong believer that enjoying wine is as much about the experience, setting, food pairing, and people as it is about the wine itself. As such, I intend on posting about the whole experience surrounding our wine adventures, so bear with it. 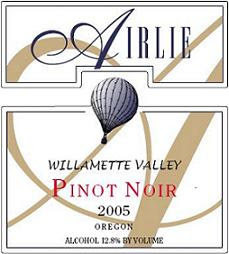 Tonight's endeavour was a bottle of 2005 Airlie Pinot Noir--a winery from Monmouth, OR. Drew picked up this particular bottle at a wedding a few weeks ago. We matched it with bbq'd new york strip steaks with garlic pepper, roasted sweet red peppers with olive oil, steamed brocolli with a light lemon and garlic sauce, and grilled chocolate-rum banana for dessert. My first impression of this wine was so-so. Initially, the nose was a bit bland and while the taste was decent, it didn't seem to be anything too special. It did pair with the steak quite nicely, but I had drunk some Airlie previously and was less than impressed, and I was thinking this wasn't going to pass muster with the high bar of Willamette Valley pinot's. About 30 minutes later, though, we poured the second glass and it was a world of difference. The coloration is the beautiful medium-red transulcency that you see in a good pinot, and while Airlie says that you should get red cherry and vanilla on the nose I wasn't getting that even on the second glass. I've never been good with that, though. After the wine opened up, I did notice distinct strawberry flavors with a bit of spice, along with your traditional pinot dust. This is a smooth, drinkable wine that matches well with food. While I was a tad underwhelmed with the initial tastes and the fact that the nose never really opened up, once the wine had a chance to develop a bit I really enjoyed it (and still am as I write). I'd certainly recommend this one, but would advise you to aerate (or decant) it before drinking to really bring out the intensity of the wine. Welcome to the Oregon Wine Blog. This will be a space for us young adult, up-and-coming, nearly snooty wino's can chronicle our experiences, trials, and tribulations living in the heart of Oregon Wine Country--the Willamette Valley. We'll make posts about wine, wineries, events, trips, food, friends, and whatever else comes to mind.